Where have I been you ask??? Well good question something happened to my Internet Bigpond changed my password on me and I have been unable to access my Internet or emails since Friday ... As you can imagine I haven't been to happy. 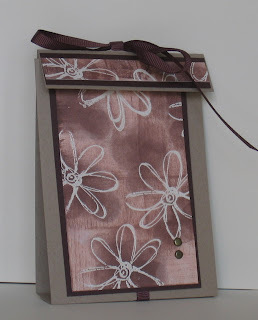 Here is a cute idea a cute carry bag for sweets or chocolate. The Bag is made using Kraft paper measuring cm x cm. Scoring at 12.5cm, 15cm and 27cm this when folded will make the outer bag. 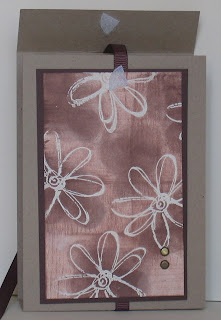 I then stamped the Flower from the All Natural stamp set randomly over whisper white using Versa Mark and embossed the flowers with white embossing powder. 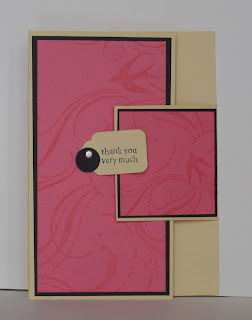 Using my sponge dabbers a sponge blush blossom and close to coco inks to completely cover the card. I then took a soft tissue and rubbed over the flowers to make them "pop" I then swiped my close to coco ink pad over the flowers to create more depth. You might have to click on the image to get a closer look. I cut the stamped image down to 7cm x 11cm and mounted it onto chocolate chip. The flap was covered using left over when I cut the card down to fit the front of the bag. The chocolate chip ribbon is placed behind the image I then cut a slit in the top of the bag and puled the ribbon threw to then tie bow on the top. The bag is kept closed with a small piece of velcro. Hay there...wondering where I have been???? Just so busy getting back into the routine of work again. Jut not enough hours in the day!!! I guess most of us feel the same. I really like the effect of just using one colour, especially chocolate chip. The base card is chocolate chip. I then cut very vanilla just smaller than the card front so it would leave a border of chocolate chip about 1mm all the way round. 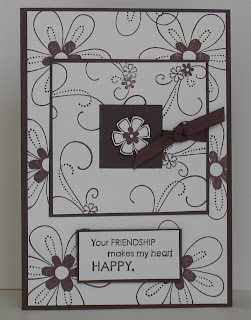 I stamped the flower from Friendship bloom stamp set in chocolate chip. 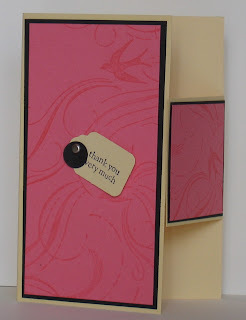 I then punched a square out of a vary vanilla card using my large square punch and then trimmed around it. I stamped the flourish from Friendship Blooms tied the chocolate ribbon and adhered it to a larger square of chocolate chip. I then mounted it onto the very vanilla with dimensionals. 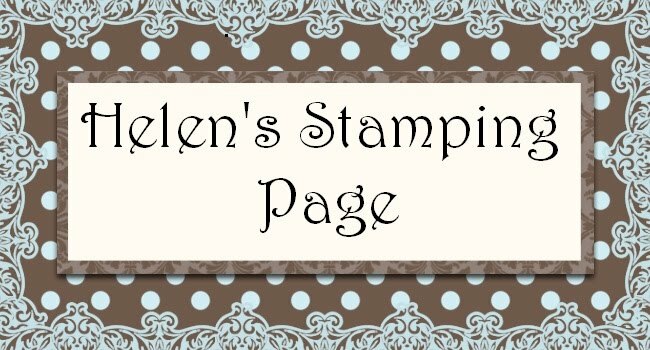 Finished it off with the words stamped in chocolate chip and again mounted it using dimensionals from Stampin Up!